hen I was born, I guess that we had as much as anyone. 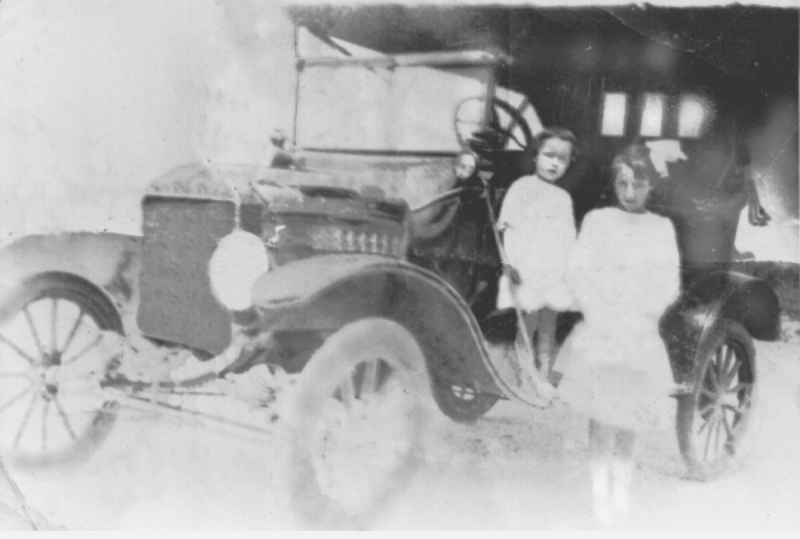 We were one of the first families in Marshall county, Alabama to have a Model-T car. What Fun! I remember that one day, we had all gotten ready to go on a picnic in the T-Model and it started raining. Papa said that because of the rain, we couldn’t go. We insisted that it wasn’t raining in the middle of the road! Ruth Hill, mama’s cousin, lived with us for five years. She was the daughter of Rose, Louise Patterson’s sister. When I was four years old Ruth went to Snead to school. Papa put her trunk in the back seat of the Model-T and I sat on top of the trunk—patent leather shoes, sailor hat, my feet straight out. I had cried all night but now I was happy for I thought that I was going to school with Ruth. What a loud crying went on when I found out that I was only taking Ruth and that I was going home with Papa. Ruth said, “No!” She already had the ring in her jacket pocket. She took my hand and went out on the porch and handed him his ring. He was on the ground and we were on the porch. He cried and argued, but she took my hand, turned her back, and went inside. It was shortly after this that she went to Snead to school. Ruth and I slept on one bed and Aunt Matt and Lillian slept on the other bed in the same room. Ruth’s legs hurt all the time so she would put them straight up in the air and rub them. Once, Aunt Matt yelled at her. Aunt Matt had seen the white legs in the dark and it scared her. While Ruth was in school at Snead I would go visit her. After I started school at five years old, I would spend week-ends with her. Some times when I went to visit, Mary Will went with me, and sometimes Lillian went. The younger girls never did. The public school where we went was about six blocks from Snead. When school was out on Fridays I would walk to Snead and stay till Monday morning when I would walk to school and then home that evening. Snead was a boarding school with separate homes for boys and girls (and they were called ‘homes’ not dorms). 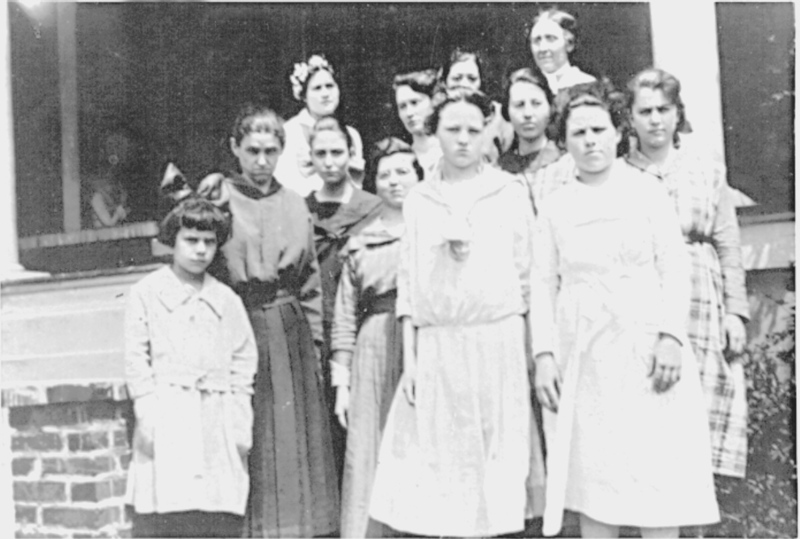 There were about sixty girls and sixty boys at Snead each year. Classes were held for nine months and the students went home for the summer months, but the matron was in residence all the time. Snead had no day students. The school was for older students, late teens. There were two students to a room so each home had about thirty rooms. For some reason, Ruth never had a roommate. In addition to the bedrooms, each home had matron’s quarters, teachers’ rooms, staff rooms, visitor’s parlor, library, kitchens, and dining room. For about three years two big dictionaries were kept on the floor in the dining room to be put on the chair for me, so I could reach the table. The homes had three floors with two wings each. Each wing had a bathroom with four tubs and four toilet bowls. Water was heated for baths and for the kitchens on a big boiler attached to the coal stove, so everyone got only one hot bath a week. Snead was a self-supporting school. They had gardens and chickens. Ruth was in charge of the chickens and eggs. She got paid a small amount of money for this. They also let her make candy and sell it in the sun-room. After she had been there two years, she could come to visit us for two days at Christmas time. The matron at Snead had a grand-daughter my age who stayed with her. Then the matron died and I don’t know what happened to her grand-daughter. Maybe she had parents and went home. The new matron lived in New York and would go home during the summer. Then, Ruth stayed as care-taker of the home. She didn’t do any work, but took charge of over-seeing everything. During the summer months she even stayed in the matrons rooms. There was a small kitchen in these rooms and she didn’t have to use the big kitchens. Ruth was not alone during the summer. There was a year-round maintenance man with a wife and two boys who had a small apartment in the building. One Friday Mama told me to come home after school instead of going to visit Ruth. I didn’t say anything and after school I went straight to Snead. By that time I was almost a fixture there and I could go straight to Ruth’s room. On Fridays if she wasn’t in her rooms she would leave the door unlocked for me. I would knock and even if she didn’t answer, I could go in. That Friday, I knocked, walked in and there sat Mama! She had been shopping and had bought green plaid wool for me a dress and of-course blue plaid for Mary Will. She made me go home. Ruth died in the hospital at Florence, Alabama of cancer of the liver in 1927. I am psychic and when you love someone the psychic bond is very strong and I loved Ruth as much as I loved my own mother. The following story comes direct to you who are reading this across the years from me. For those of you who don’t believe me, that’s O.K. but every single word is true. The date is June 1927 and I am thirteen years old. Ruth is dead and I know nothing of death. No one I’d loved had died before, although I had seen dead people. The funeral is over. Mama moved my mattress into her room on the floor, for I couldn’t be consoled. Mama and Papa had to go somewhere for a couple of hours to make arrangements to go get Ruth’s belongings. All of us were there. Even Lillian and Riley were spending the night. All the lamps were lit, but everybody had gone to bed. I don’t think that I had even dozed, but someone called my name. I sat up. “I want to show you a miracle,” the voice said. “I hope you can understand. I show you death.” It was not dark before but suddenly the room was so light that it hurt my eyes. An angel with a very peaceful, happy face appeared. Then the voice said, “I show you life.” And it was as if the lamps were not lit, it was so dark. Then a terrible witch with pointed hat, fanged teeth, and bloody finger nails appeared. And then that too was gone. I was still sitting up in bed when Mama and Papa came. Was it a dream? Was it Satan tempting me with demons? But, what kind of God would allow the devil to do that to a stupid kid like me? I’ve never been afraid to die since I was thirteen years old. That was only the first of several psychic experiences that I have had!